Today is prep day for the High Holy Day of the year, tomorrow. Without specifically setting it as a goal, pretty much all the dishes I am responsible for will be based heavily on foods from our own garden and a turkey produced on pasture by my farming friend. I went to pick up the bird yesterday. She said we got the prize for the largest bird - a twenty-five pounder. I'd only asked for a twenty-two pounder, but we can handle twenty-five pounds. I've just settled it into its day-long brining soak with citrus peels and herbs from our garden. 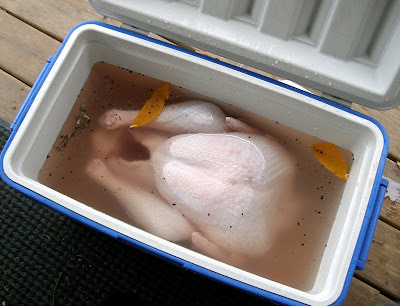 Tomorrow before sending my husband (the grill master) off to my aunt's house with charcoal, the grill and the bird, I'll ice down the breast with the turkey resting breast down on a bed of ice, and a bag of ice inside the cavity resting against the underside of the breast. The leaner breast meat typically cooks faster than the legs and dries out by the time the legs are fully cooked. This chilling process evens out the cooking rate, so everything is done to perfection at the same time. Today I will harvest and clean leeks from the garden, and a large savoy cabbage. I'll also prepare the two sauces to go with one or two of our pumpkins that I'll prepare tomorrow morning according to a favorite Afghan recipe. I like giving traditional foods a non-traditional twist. I've already begun prepping some of the stuffing ingredients; the wild rice is soaking and the fresh bread cubes have been drying in a mostly cold oven since Monday. The kitchen will be messy and occupied most of the day. I'll get the au jus gravy done today with the extra necks my friend sold me with the turkey. Since we grill the bird, we don't get any pan drippings on which to build a gravy, so this extra step is necessary. But grilling is the way we go since it not only produces such a delicious, moist bird, but it also frees up the oven for all the other dishes that need to be made at the same time. And yes, we checked to see if a 25-pound turkey fits on our Weber grill. It does. Tomorrow we'll sit down to a table with twenty-one of my kith and kin. Aunts, uncles, cousins, parents, in-laws, and now the small children of my cousins. I come from a family of excellent cooks and appetites to match. The spread will be impressive. After the mid-afternoon meal, and kitchen cleanup, many of us will bring out our bags of change and play poker. Others will chat or nap on the couch. Someone will keep the woodstove going all afternoon into the evening. We have much to be thankful for this year. Our new Red Star hens have finally, finally begun laying, or at least one out of four of them has. We bought them as "ready-to-lay" pullets in early October. They should have been laying by mid-October at the latest. Yet we didn't get a single egg for more than a month. Saturday we saw our first egg. The lack of eggs was mystifying since the temperatures here have been very mild for the time of year, and I even took to lighting them starting early in the morning. Here's hoping that single egg heralds a flood of eggy goodness. We've taken the plunge and decided to go forward with a passive solar heating system. This will cost a lot of money up front, but we'll get roughly half of it back in rebates and tax deductions at both the state and federal level. Not to mention, the price of oil will no longer affect our ability to heat our home. (But yes, in case you're wondering, I'm still deeply conflicted about EROEI, the lifespan of this system, and this sort of spending when we don't know whether or not my husband will have a job after the new year. I just don't see any better options for us.) Work on this project should begin next month. Meanwhile, we've extended the radiant heating system from just the two rooms of the "new addition" on our house (it was already built when we bought it) to the kitchen, which is the central room of the house. These are the only three rooms that will be heated regularly (the last two winters we got by with just two), and we now have programmable thermostats to control each zone of the heating system. So we're fine tuning the heating program to keep the house just warm enough for comfort. My husband has argued me up to a daytime set point of 65 F. After the passive solar is done and inspected for heating, we may look into expanding it to provide for our "domestic hot water" needs - in other words, hot water from the tap. Our cat is not doing well. I reported in February that she'd been diagnosed with hyperthyroidism. Unfortunately, she also has kidney failure, and has recently developed cancer too. Up until this week though everything looked good. She had a spring in her step and still loved to spend the day outdoors. Given her multiple conditions, the prognosis from the vet, and her age (14.5 years), we decided not to try any costly medical interventions. While her hyperthyroidism is easy to control, it looks to me like either the kidney failure or the cancer is catching up with her now. My gut tells me she doesn't have any better days ahead of her. Having put off the euthanasia decision on my last cat for too long, I'm motivated to not allow her to decline too far before making that difficult call. We'll use a vet that makes house visits when the time comes. My husband has been working on turning a corner of our basement into a root cellar. Much of the work is already done, but the door is the tricky part. With an old farmhouse, the basement is of course very low, and there's no way we're going to find a door to fit the doorway at a hardware store, much less a pre-hung door. And the space needs to be fairly well sealed in order to keep the temperature low inside. This is especially true since the basement is much warmer overall since having the house air sealed and the insulation improved. We need a good barrier between the root cellar and the rest of the basement. I'm hoping this gets done in time to take some of the cabbages still out in the garden. Our other fall project is the conversion of a corner of our shed into winter housing for the hens. Their mobile coop and pen provide too little protection from winter wind and really cold temperatures. The unheated shed will at least get them out of snow and freezing winds which could cause frostbite on their combs. We have electricity in the shed, so we can light them in the darkest days, though I plan to throw open the shed doors whenever feasible to give them some natural light too. Unfortunately, the doors face almost due north, so there will be precious little full sun for the girls over the winter. I'll be trying an experiment with deep bedding in the shed, which should allow me to never clean out their stall until they go back to rotational grazing in early spring. As a bonus, the 12" deep bedding that they're on all winter will be excellent material for lasagna mulching, which will come in quite handy for the permaculture guild I'd like to establish around a couple of our fruit trees next year. More details on this in a future post. 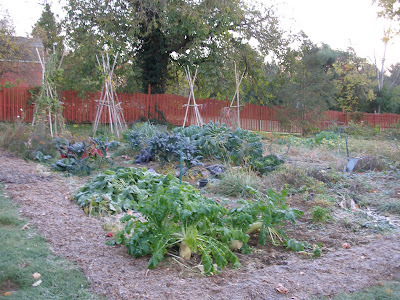 I've arranged to offer an introductory homesteading class next spring. I'll be taking a break from my usual cooking classes and trying something new instead. I'm nervous but excited; I feel under-qualified and I worry about taking on so much during one of the busiest times of year. No idea whether anyone will enroll or not, but I feel compelled to try. I'm reminding myself frequently that it doesn't take a certified expert in a subject to teach people things they didn't know before. I fully expect to learn from my students (if I get any) as well as teach them. I've been supplementing the girls' feed with acorns every other day or so. They love them. I think they're starting to develop a Pavlovian response to the sound of me crushing the acorns in a burlap bag. They make their excited little anticipatory sounds as I go through the acorns just before tossing them into the pen to make sure each one is crushed and open enough for their beaks to get at the good stuff. The acorn meats are bright yellow and surprisingly soft; softer even than a fresh chestnut. The girls devour them eagerly. I find it incredibly satisfying to feed them something I got for free in my backyard. The acorn drop is over, but I really enjoyed collecting the nuts in October and early November. It was like a six-week long Easter egg hunt, and a race with the squirrels, who still got plenty. I may have to keep an eye open for other nearby oak trees next year. We attended a class for beginning beekeepers and a meeting of our local beekeeper's association. I got the distinct impression that we were regarded as "fresh meat" at that meeting. The average age in the room was definitely over 60, and it was nearly all men. Not only are these people experts, but they want new beekeepers in this area. And the meetings take place pretty close to our home. It looks like we're going to go ahead with adding bees to the homestead next year. It's a vast subject to learn about, and there are so many things that can go wrong with bees. But I'm excited to try nonetheless. -All the news that's fit to print. What's new with you? Did you know that if you live in the US and use a pressure canner, you can probably have the accuracy of the pressure gauge tested for free? Neither did I until I read Sharon Astyk's latest work, Independence Days: A Guide to Sustainable Food Storage & Preservation . Like her earlier works, this one is excellent and contains tons of useful information for those who preserve their own foods. That's how I found out there's another way I can make good use of the state taxes we pay. The Cooperative Extension offices in most counties of the US will have someone on staff with the equipment and know-how to test a pressure canner. And they'll do this for you for free. I got my pressure canners for free through craigslist, and they are obviously old and well used. Though I replaced some of the rubber parts that came with the canners, I had no way of testing how accurate the pressure gauges were for myself. Having now had them tested, I know that both of them read a little high around the 10 and 15 pound mark. That means I've been canning my foods at pressures that are slightly lower than recommended. The woman who tested the canner gauges for me said that if I followed all other canning instructions to the T, I'm probably fine eating those foods. My gauges were only off by one half to one pound. (I know that with almost every canning batch I've had trouble not overshooting the recommended pressure at some point during the canning process anyway.) She said it's fine to keep using the pressure canners so long as I correct for the slightly faulty readings on my gauges. It's good to know this about my pressure canners. If you use a pressure canner to store food for your family, I recommend you take advantage of this free testing service. After all, there's no point in preserving your own food if you can't be confident you can do so safely. With the gardening season mostly done for the year, this would be a good time have the testing done. Just so you know, you probably only need to take the lid to the Extension office, not the entire canner. But check with the person who does the testing to make sure. We had contractors in the house in late October to work on air sealing our 130-year-old home. (For those of you in Europe, any home this old is considered venerable in the US.) We'd had our home evaluated for energy efficiency earlier this year, so this was the follow-on work to improve our "envelope" as they say in the business. We were pleasantly surprised to find that as old as our home is, the efficiency was no worse than the average new construction home. Still, there was room for improvement. Of course, these improvements cost money, and not a trivial amount. For what we spent on energy efficiency improvements, we could have made a couple mortgage payments. We see this as a necessary precondition for installing any form of sustainable energy heating system though. Where we live, we heat our home fairly steadily from mid-November to mid-March, with an extra two months of at least occasional heating. If we're to spend money on passive solar heating, or even if we stay with oil heating as long as that's feasible, it only makes sense to make our home as efficient as possible. It's simply the right thing to do, and we can afford it at the moment. I know a lot of people out there can't even contemplate spending a few thousand dollars on energy efficiency, no matter how much sense it makes. I've posted recently on cheap insulating strategies, and I urge you to check them out if you haven't already. There are tips there for both renters and homeowners. But I picked up a couple extra tips on air sealing from the contractors that I want to share. Install safety guards in all electrical outlets on exterior walls. You know those little plastic plugs that prevent toddlers from sticking their fingers in sockets and electrocuting themselves? Put them to good use even after your kids or grandkids are grown. Electrical outlets are very often heat leaks because they reside in gaps in the insulation of your walls. The plastic guards can significantly reduce the infiltration of cold air through these gaps. Look to the cobwebs. Maybe you're such a tidy housekeeper that there are no cobwebs in your home. We've got 'em in spades. Spiders spin their webs where there is airflow. So when you see cobwebs near windows or doors, it's a good indication that there's an air gap somewhere very close by. Cracks in plaster walls are another major culprit. Check the trim work around all windows and doors. Very small gaps between the wall and the trim allow for an amazing amount of heat transfer. This can be true even if you have modern double- or triple-paned windows. Silicone caulking is your friend. Use it to seal those gaps, even if they look too small to be significant. Believe me, they are significant. Silicone caulking is cheap and simple enough to use that anyone can learn to do it. Get a good scraping tool for the excess caulk to make it look neat and tidy. After a little practice you'll do very nearly as well as the professionals. 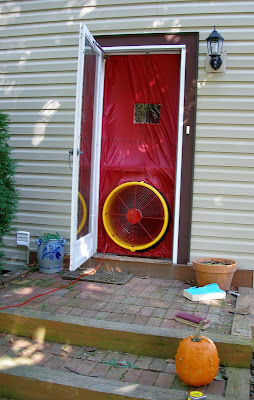 With a blower door installed, every air gap in the house becomes evident. If paying a professional to install insulation or air seal your house is out of the question, you might want to schedule an energy audit that includes a blower door anyway. Many utility companies apparently offer free energy audits to their customers, or some portion of their customer base that qualifies based on income. Ours does not. Even if you have to pay for an audit, it will likely cost a small fraction of what the air sealing and insulation work would, perhaps a few hundred dollars. The blower door will show you exactly where the air gaps are in your house. Some of them you may not be able to address with silicone caulking and a little ingenuity. It may take professional expertise and/or tools. But if you're better set up than we were to mark the air gaps that are evident when the blower door is in place and operating, you could then go about remedying many of them yourself after the audit is finished. I recommend you use brightly colored sticky notes to mark the location of air leaks. Trying to write down all the locations of leaks while the blower door was in place didn't work for us. There were too many to list, and we sometimes weren't sure afterwards what was meant by our own notes. If you take the time before the energy audit happens to work on sealing the obvious visible gaps, you'll be ahead of the game, with fewer air leaks to record during the brief time the blower door is running. Adding insulation to an attic is also work that can be done by non-professionals. If you've got a weekend and the motivation to do so, this is a job you can do for yourself. Check out a book from the library for some basic tips if you feel you need them. If your furnace resides in an otherwise unheated, unfinished basement, you might want to put some insulation on the walls around the furnace. Unfinished basements are very common in our part of the country, and furnaces tend to be situated out of the way and right up against a wall. The basement walls in our house are stone in the oldest part of the house, and that stone obviously conducts heat away from the furnace and into the earth. Stopping that constant draining of heat away from the furnace makes a big difference in how often it must fire up and consume fuel. The good news after all of the expense and work we put into these efficiency improvements is that our home is noticeably warmer and the temperature steadier. We can tell that the house is losing less heat overnight, and it warms up faster when we put the heat on in the morning. It's nice to have such a noticeable and pleasing improvement for the money spent. We now feel ready to seriously consider alternative heating for our old home. More on that to come soonish. It's a rare meal these days that doesn't include something either homegrown or something I made from scratch, often with local ingredients. Still, not every meal has a critical mass of ingredients to warrant "harvest meal" status. Last night's dinner did though. I made a tagine, my first ever, with a variety of homegrown, homemade, and local ingredients, plus a few that were none of those things. The lamb was pasture raised and very local, raised by a friend in fact. The cuts that had remained the longest in our freezer were the neck bones and the shanks - two cuts which happen to be traditional for Moroccan tagines. The tagine, after all, has all the hallmarks of peasant cuisine: slow cooking in one pot, vegetables augmenting meat, a fair amount of liquid, and it's traditionally served with couscous or flatbread. The nobles, we must suppose, got the leg and the rack. I posted last year about making lamb stock from bones given to me by my lamb-raising friend. She gave me some more this summer, so I now have a nice quantity of canned lamb broth from a sustainable, local source. I used only about a pint of this to make the tagine. As stews go, tagines are light on the liquids. Into the tagine pot (really a dutch oven) also went a tiny bit of our homegrown garlic, a very large leek from the garden, the last of our "summer" carrots, a little of the parsley that is still holding on out there, and one of the stella blue Hokkaido squashes we grew this year. This was our first taste of these winter squash, and my husband liked it. Stringy, fibrous winter squash gives him the squicks, and I had purposely planted this squash variety for its reported "fiberless" qualities. So it made me smile when he remarked on how acceptable it was to him. Purchased ingredients in the tagine included some slivered fresh ginger, half a can of tomatoes, prunes, golden raisins (or "sultanas" for those of you visiting from overseas), cinnamon, black pepper, kosher salt, and a bare drizzle of olive oil. I didn't really follow a recipe, so I can't provide you with one. But I started it on the stovetop, giving the meat a very light searing before adding most of the other ingredients. Once the liquid (just enough to cover) was in and simmering, the tightly covered pot went into a very low oven (275 F/135 C) and stayed there for several hours, only getting pulled out to add a few ingredients, and to check the flavor. The squash and the raisins went in only for the last hour or so of cooking, and I added just enough extra broth at that point to again cover the ingredients. One of the shank bones came clear out of the meat when I gently stirred things about. When it was done I added more minced parsley and served it over some Israeli couscous cooked up with local shallots. The slow cooked cuts of lamb were incredibly tender. And the gelatin naturally present in the shanks gave the tagine a slight thickness. Very satisfying on a chill evening when the dark draws in early. In retrospect, we might have preferred to serve the tagine over some homegrown mashed potatoes. That wouldn't be authentic, but neither was the Israeli couscous, and my husband didn't think that suited the tagine. It would have been nice too to try a little corriander and cardamom in the tagine, or lemon juice spritzed over each serving, but the flavor was surprisingly good with just the flavoring ingredients listed. Lemons are on our list of things to start growing next year (in a container), so maybe at some point I'll be able to include homegrown lemon in my dishes! I like the combination of vegetables with dried fruit and a meaty broth. I could easily see making a tagine without any cut of meat at all. 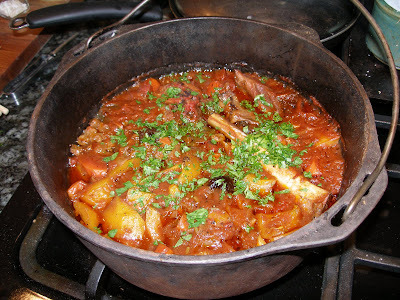 There are a ton of different tagine recipes out there, with a huge variety of vegetables. So lots of exploring to do! 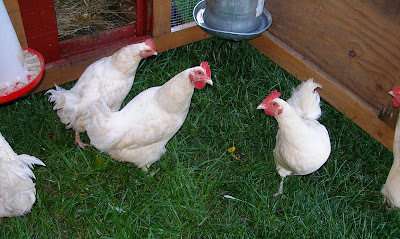 We first added a tiny flock of backyard chickens to our mini-homestead in spring of 2008. We really enjoy having them, and they've been easy to manage. I'm only a slightly-advanced-beginner chicken keeper. So I'm curious about the differences between various laying breeds. Having had only two breeds, we just don't know all that much about the range of chicken personality traits. In fact we were surprised that there were any significant differences in behavior from breed to breed. Don't know why this is so. It doesn't surprise me at all to see behavioral or personality traits differ between, say, German shepherds and Jack Russell terriers. By chance we started with Red Star hens, switched briefly to White Marans, and are now back to Red Stars. I feel lucky to have started with the breed we did, since it seems to me now that Red Stars are ideal for our situation. We could easily have been less lucky; our feelings and decisions about keeping chickens could have turned out very differently had we started with a different breed. So I would caution anyone who has never kept chickens before, especially those with limited space and in close proximity to neighbors, to research the breed options carefully before getting your birds. Red Star - An extremely quiet breed. The only noise they make above normal, very muted, contented or mildly excited burbling noises are when they are truly alarmed by something, or when actually laying an egg. They are very docile and not highly strung, meaning they calm down quickly after an alarming event. They eat like vacuum cleaners however. Someone described them to me as the "Labrador retrievers" of the chicken world. This is accurate in my observation. However, they are also very unfussy eaters once they become accustomed to the idea that what I throw in their pen is generally a treat. They readily eat many weeds and kitchen scraps, as well as sub-par produce and many garden pest insects. This means their eggs have fantastic coloration (in the yolks) and nutrition. They are excellent layers even after two years of age. A great choice for those with little space and neighbors close by. White Marans - A heritage dual-purpose breed. These are larger birds than the Red Stars and far more vocal. They will loudly protest captivity as soon as the sun is up (sometimes before it's even properly up), which can be problematic in the summer. They also seem to have "fits" of nervousness over nothing in particular which spreads from one bird to the next and leads to loud alarmed squawking of the entire flock which can go on for 15 minutes or more. They are fussy eaters with little interest in several common garden crops including lettuce greens and tomatoes. They did enjoy summer squash and Japanese beetles however. As is to be expected from a dual-purpose breed, they are not great layers even in their first year of laying. The eggs they do lay are absolutely gorgeous however, speaking here of the dark coloration and occasional speckling of the shells. In general, while I support heritage breeds, this one is not a great choice for those in suburban or densely populated areas as their noise could easily annoy neighbors. Also not a great choice for homesteaders or those trying to maximize home economy by supplementing purchased feed from the homestead's own resources. For those without nearby neighbors who want one breed to do two things (meat and eggs) moderately well, this breed may be of use. Do you keep chickens? What can you say about the characteristics of the breeds you know? If you keep either Red Stars or White Marans, do your observations differ from mine? We live where green lawns are not capital crimes against nature. Rainfall can be relied upon year-round, at least in "normal" years. 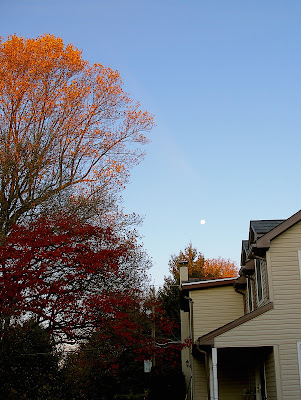 If you can say the same for your area, and you have lawn plus deciduous trees on your property or nearby, then I have a composting trick to recommend to you. Sadly, it may be too late for you to use it this year. If so, apologies, but keep it in mind for next year. In late summer or early fall, stop mowing your grass. Let it grow out for at least three weeks, (preferably more) before the autumn leaves start falling. The grass probably won't grow rampantly in this late season. Let all or most of your leaves fall on the long grass. Don't rake them. Wait for a day when the leaves are as dry as possible, at least a few days after any rainfall. 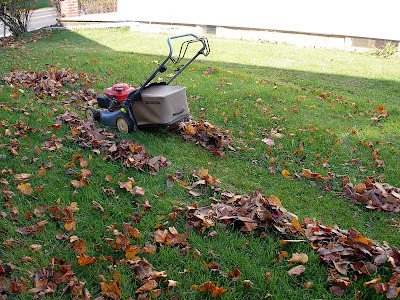 Cut the lawn using a lawnmower with a bag, running right over the fallen leaves so that they get chopped up, mixed with grass and saved in the bag. Dump this mixture in your garden, compost bin, or anywhere you'd like a new bed for the spring. I've always been a lazy composter, and this tendency only got worse after we got hens and a worm bin, which took care of more than half the material that would otherwise be composted. So I've never fussed over the temperature of my compost pile, nor bothered with watering and turning the pile. Compost chez nous happens in its own time, which is to say, very slowly. But the neat thing about the fall leaves and grass trick is not that it saves a good deal of leaf raking. No, the coolest thing is that dried leaves (carbon, or "brown" matter) and green grass (nitrogen, or "green" matter) are pretty close to the perfect combination of materials needed to make your compost pile decompose rather quickly. A pile of leaves alone will hardly decompose at all over a year's time. (Ask me how I know this some time.) The shredding action of the lawnmower blade helps break down some of the leaves, at least, into smaller pieces, further speeding decomposition. This mixture is ideal for the compost layer in a new bed that you plan to lasagna mulch (aka sheet mulch). We keep a portion of our property in lawn for the benefit of our laying hens. All through the summer we cut that lawn without bagging the clippings. They sit on the ground to replenish the soil. But the manure from our chickens is also enriching the lawn month after month. A once-per-year harvest of that high-nitrogen content grass in the interest of the garden proper seems a good practice to me. 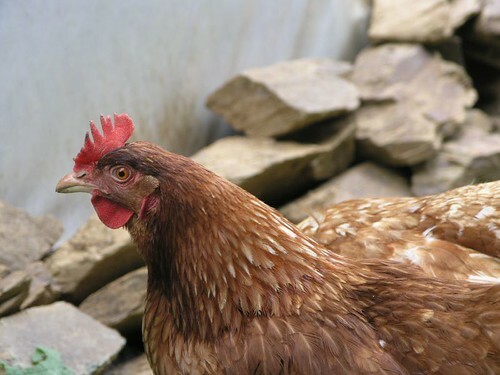 While I'm sure that some of the nitrogen from the hens' manure can make its way from the grassy surround of the garden into the garden soil itself, it doesn't hurt to facilitate that transfer once in a while either. We have only a very small bag on our push mower, so this is a tiring and time consuming task at a busy time of year. Even when I dump the contents into the wheelbarrow to make fewer trips, the wheelbarrow fills up very quickly. In all honesty, if I remember it in time, I may look to barter next year for a one-time lawn cutting with someone who owns a large mower with a bag, preferably one of those fancy mowers that practically pulverizes the clippings. However it gets done, adding all that organic matter to our garden is worth it. Today I made the third of such piles in our garden. I stuck my hand into the middle of the one I made two days ago. It was too hot to comfortably leave my hand in there very long! Out just before sunrise this morning to tend to the hens. 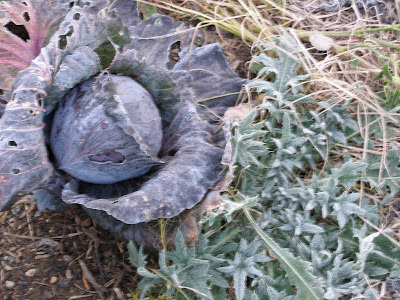 The garden looks tired and careworn, but the cabbages are holding on. 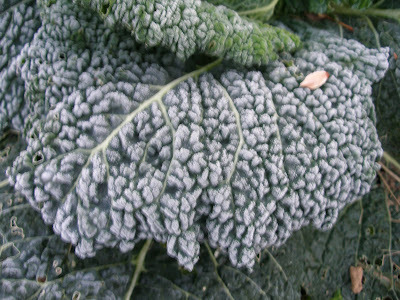 Tuscan kale, gilded with frost, to be harvested today. get a soil test done. If you live in the northern hemisphere, hardly anyone is thinking about having their soil tested right now. 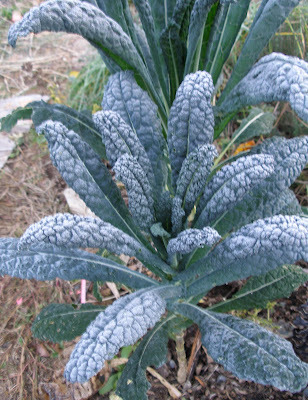 If you plan to start a garden or even continue one next year, this is great information to collect now, before the soil freezes over for the winter. If you live in the US, your state Agricultural Extension Office is looking at a light workload in the fall so far as soil tests go. Your soil test will be done in record time. In March and April, it'll be an entirely different story, and you may wait weeks to get your results back. So don't wait for spring. Pick up a test kit from your local Agricultural Extension Office and get it done now. When you get the results, it should give you a good idea of what you might want to add to your soil to amend it. Forewarned is forearmed, as they say. Better to have this information now than to wait until the blueberry bushes arrive, only to wonder if the soil will be suitable for them. Oh, and while you're at the Extension Office, ask if they have a sapling sales program. Our county has one, and they'll mail out a flyer and order form to anyone who asks for it. But you have to ask for it. We've gotten saplings and even small blueberry bushes for very, very little money through this program. Find out if such a thing is offered through your local office, and get yourself on the mailing list so you'll be included for the spring mailing. If not, take a few moments to ask the staff what other services might be available but not widely advertised. You might be surprised what's available. We had the first few hours of wan sunlight in about a week yesterday afternoon. I did some garden cleanup and harvesting. Picked almost 50 pounds of apples. It doesn't look like a good year for our apple tree. This isn't surprising in a year when so many other things were just "off." A great many of our apples are tiny, and many others have large cracks in them while still on the branch. I've never seen either of these things happen before. I may go to Rodale or another organic orchard to pick extra apples for our upcoming cider pressing. I also rounded up the remaining nine pumpkins in various stages of ripening and set them up to dry in what sunlight we had. The surprise yesterday though was finding so many underripe poblano chili peppers still on the plant. We had a frost about two weeks back which should have killed the plants. Somehow they've held on. 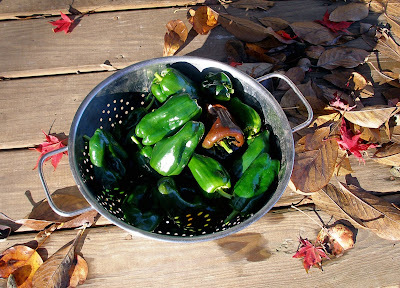 Although the peppers mostly haven't matured, and so will lack the characteristic flavor of the poblano, I couldn't bear to leave them out to rot. I got just over two pounds of peppers. Now I'm pondering what to do with them. I may have to make an evil chili pepper cheese dip and indulge in a large bag of tortilla chips. Perhaps if I include some ancho chili powder it would make up for the lack of flavor from these shiny green chilis. Yes, I have my foodie secret vices, even if they're made from organic ingredients! But if you have other suggestions for a pound or two of chili peppers, I'm all ears. If you've been following my Frugal Action Items this year, I hope they have helped you shift to a more frugal mindset. If so, what I have to suggest this month might be obvious or redundant. But perhaps you read some of the Action Items and would have liked to participate, but something held you back. Did you lack a tool that would have enabled you to put the Action Item into practice? Well, it's not too late! Fast approaches season of socially-obligated spending. If you know someone is going to be spending their hard earned money on you soon, why not ask for something you need to live a more frugal life? It may seem a little vulgar to be thinking this far ahead about your holiday gift wish list. But I'm bringing this up now so that you have time to work up the nerve to speak with that lovely great-aunt of yours who always buys you the most perfectly unsuited things for the holidays. Talk to her now before she spends the money. She means well, I know, but try to find a way to steer her towards a better use of her funds. And for the record, this is something I'm determined to do this year as well. You don't need to seem crass in talking about what you'd prefer to receive. I've tried to come up with several suggestions for modest-seeming requests. Use the angle of wanting to shift to a more sustainable lifestyle if it will help smooth such a delicate conversation. Tell the gift-giver that you're finding it difficult going, so you're looking to those close to you for support in this new goal. If you simply can't pull that off without feeling caddish, there's always the charity option. Long underwear - Probably one of the most economical investments if you live in a home you must heat for several months of the year. An extra layer of clothing that allows you to turn down the thermostat will repay itself in savings very quickly. Ask for long underwear for yourself and/or your kids if you have any. If you already have some, ask for a second or third set. That way you'll have some to wear while your first set is being laundered. A third set (in graduated sizes for the kids) is good insurance against possible hard times in the future. Retractable clothes line, wooden clothespins, wooden drying rack - It's a good idea to have all of these if you don't have a permanent clothes line outside, or if you rent and move often, or if you live under the boot of one of those abominable home owners' associations that still forbids the hanging of laundry outside to dry. Don't, under any circumstances, buy plastic clothespins. They break like crazy. The wooden ones will last forever. Sustainable living reference books - As much as I'm a fan of the local library, some books are worth owning simply because I refer to them again, and again, and again. So it's good to have them on hand whenever I need to find a certain piece of information. I've already got a recommended reading list on the side bar. Many of those titles are good frugal reference books or guides to sustainable activities. Subjects you might want to own references on include: cooking and baking, gardening (season extension, biointensive, permaculture, etc), field guides for plants and wildlife in your area, food preservation (especially canning, which shouldn't be done from memory), herbal medicine, first aid, guides to raising livestock, woodworking, crafting, DIY, etc. Sustainable living tools - If there's a tool or some equipment that you've wanted to acquire to pursue some aspect of frugality or sustainability, now might be the time to ask for it. These things can run into some serious money at times, so they're not going to come from your secret Santa at work. But if you exchange "big" gifts with your significant other, and you know that sooner or later you're going to spend the money on something like this, then you might as well ask for it so that big money doesn't get spent on something less useful to you. Some ideas: sun oven, solar dehydrator, solar flashlight, hurricane lamp, vacuum food saver, a bicycle, a bicycle trailer, water filter, canning equipment and jars. Gift certificate for a seed company or gardener's supply - This should help you defray the costs of that big garden you've got planned for next year. If there are specific gardening tools that you know you will need, it couldn't hurt to put those on your list, provided that you're sure you'll get the specific tool you want, and not one that's almost right. You might tell the potential gift giver that she could feed your family for three months on $15 worth of seed. Some people would get a kick out of that. Cloth napkins - If you wanted to get on the bandwagon back in April, when I wrote about eliminating paper products, but never got around to buying a nice set of cloth napkins, here's your second chance. Just try to steer gift-givers away from picking up a set of holiday-themed napkins. You want some that you can use all year. A replacement for something worn out and necessary - Have you broken something recently that's so useful as to qualify as a necessity? A toe clip on your bicycle? Your large mixing bowl? Can your broad-brimmed sun hat not serve for one more season? Are your flannel lined jeans getting too threadbare even for winter outdoor chore duty? If there's something you've well and truly used up that you're contemplating spending money to replace, why not ask someone who's already planning to spend money on you to do so? Gift cards for your usual grocery store - This wish item may make you sound desperate or pitiable, or it may exasperate a well-intentioned gift giver who wants to get you something "special." So add this one to your list with some caution. I would recommend it only if there's nothing else on this list that you might ask for. And don't blow the gift card on imported sparkling water and brie. Even if you're not in a financial crisis, spend this gift card with as much responsibility as you would your own cash. A wall calendar - You're probably going to need at least one of these real soon, and if you don't get one for the holidays, or snag a free one, you'll end up paying for one out of pocket. This is a nice gift to ask for from someone who might feel obligated to get you a gift, but will settle for this if you specifically mention a need for a calendar. Lots of worthy causes sell their calendars as fundraisers too, so there's a chance to support a charity. Sometimes forestalling any gift at all is better than adding more clutter to your life. If you think someone who habitually gives you a gift will take offence if you come right out and ask for something other than what they normally give you, then I urge you to consider asking that person to make a charitable donation in your name. If there's a charity close to your heart, few people would be offended by such a request. Or you could ask that they make a donation to your local food bank. Who's going to quibble with charity over the holiday season? Got more suggestions for frugality- or sustainability-themed gifts? Please share in the comments!